So here’s the thing. 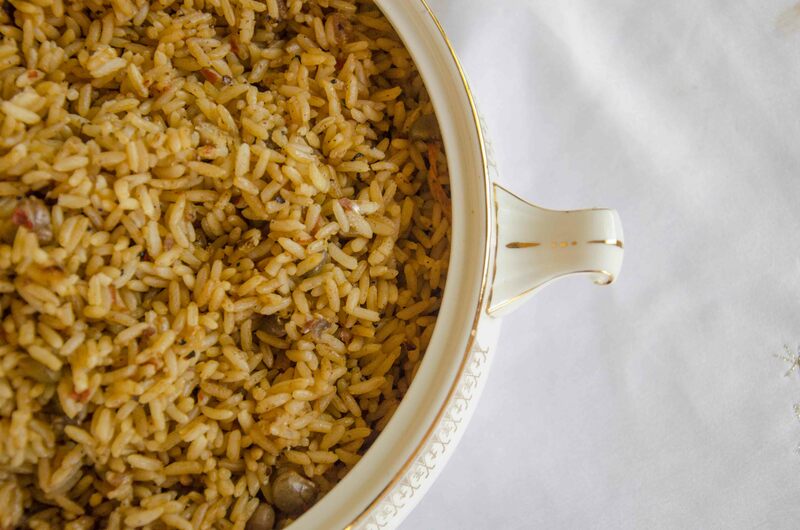 Peas n’ rice is the side dish on the table at every Bahamian event. If you go to a restaurant or take-away that serves Bahamian lunch and dinner, peas n’ rice is going to be on their menu. It’s not hard to make, but it is hard to make well. 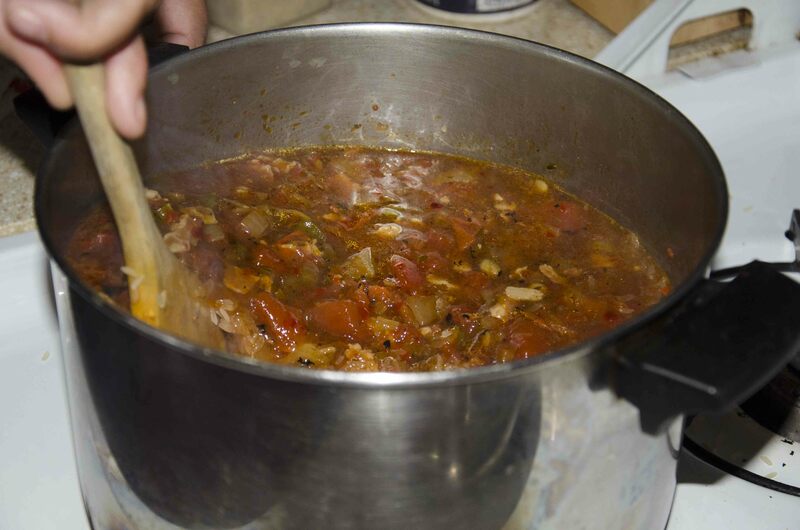 At the core of the pot are just a few ingredients, what I think of as the trinity of Bahamian cooking: tomatoes, onions and thyme. Traditionally salt pork, salt beef, or bacon is used for fat and extra flavour, but there are vegetarian versions out there as well. 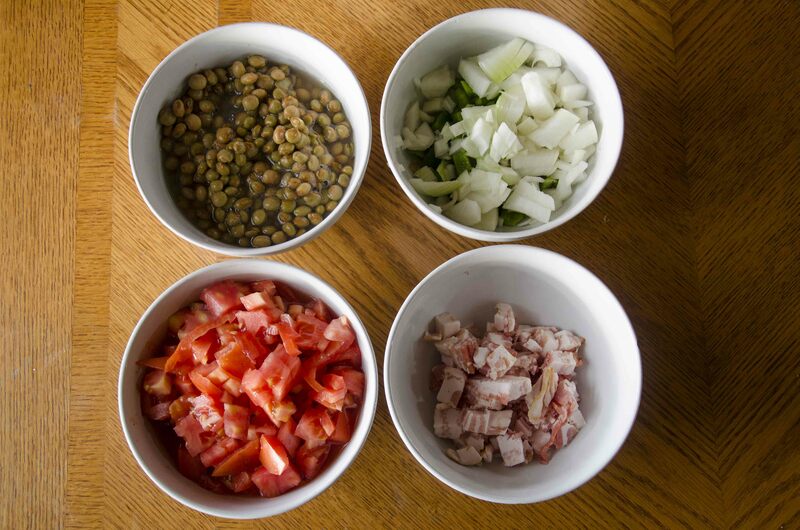 These three or four things, plus pigeon peas and parboiled rice, come together to make an incredibly aromatic, complex dish. When I found that out, I was blown away. How was it possible that the recipe could be so simple? I still haven’t mastered it, but my Aunty Ruth has. Every Sunday a bunch of my family gets together after church for lunch, usually at Aunty Ruth’s house. The menu is always Bahamian: macaroni, fried plantains, two kinds of meat and peas n’ rice. Sometimes there are steamed veggies, but Mummy and I love salad, so often we’ll make one to bring for the table. There’s always dessert too, which we have with tea. 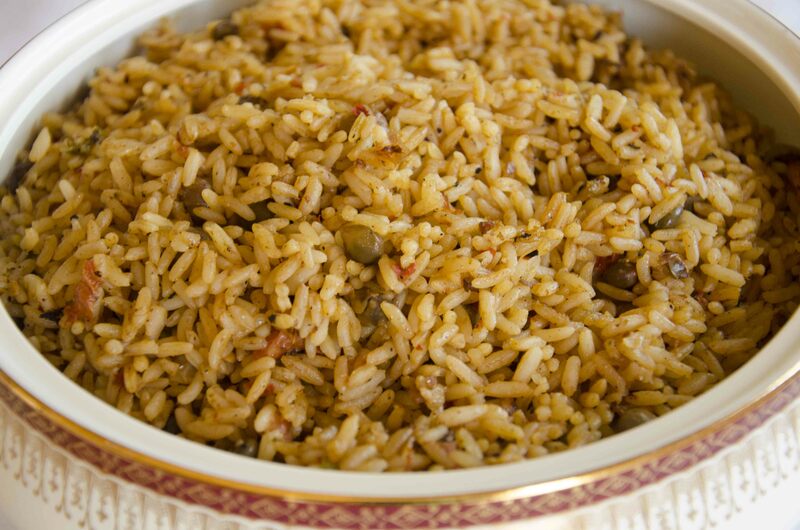 Every Sunday, the thing I most look forward to is the peas n’ rice. 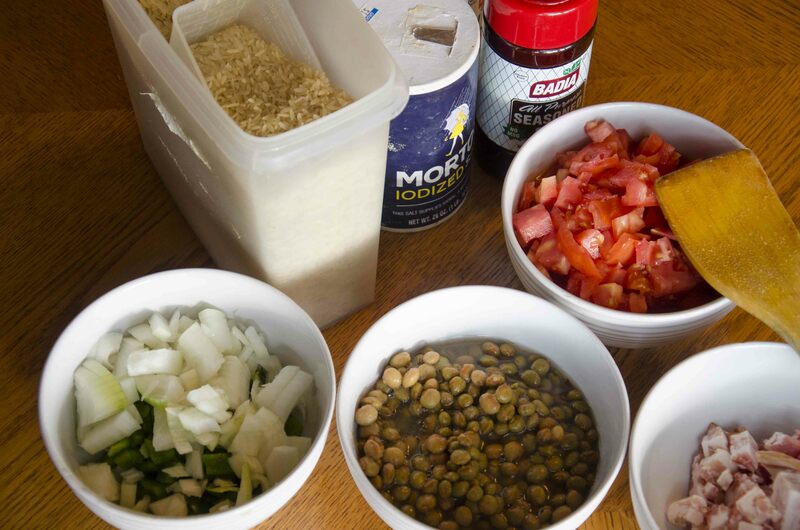 Aunty Ruth learned how to make peas n’ rice as a girl, growing up and helping in the kitchen. Over time, she developed a recipe, and surprising technique, of her own. Everything I’ve read and observed about peas n’ rice, all the ways I’ve tried it myself, involve cooking the ingredients in stages. First the meat, if you’re using it. Not long after go the onions, thyme, maybe sweet pepper. Then the tomato paste and/or tomatoes. Finally the rice and peas. Aunty Ruth used to make her rice in stages too, until one day when she just didn’t have the time to stand and watch the pot. She nervously put everything in all at once, and quickly ran off to get ready to go out. Whadda ya know? The rice turned out ok! And she’s been making it the same ever since. When I say she adds everything at once, I mean the bacon, veggies and thyme. She “fries them down”, stirring once or twice, until the tomatoes have gone from bright to dark red, and the overall volume has reduced by about half. Then she adds in the peas, rice, water, salt and pepper, and lets it all cook low and slow until the pot is finished. The fire is really low, and the rice cooks really slowly, so I have to confess that I don’t see how this method really saves time, but I do see how it frees up your hands to do other things. As you might imagine, there are countless versions of peas n’ rice. Lots of people like to put browning in theirs, though no one in my family does that. (Shout out to my Grammy and Aunt Moneira who also make amazing pots!) Lots of people also like tomato paste for its colour and rich tomato flavour, but Aunty Ruth doesn’t use that either. She prefers the lighter touch of fresh tomatoes, or in a pinch, canned diced tomatoes, instead. Another thing that distinguishes her pot is that Uncle Tim (her husband) and my cousins don’t really like peas, so she uses less than you’d find in most other versions. 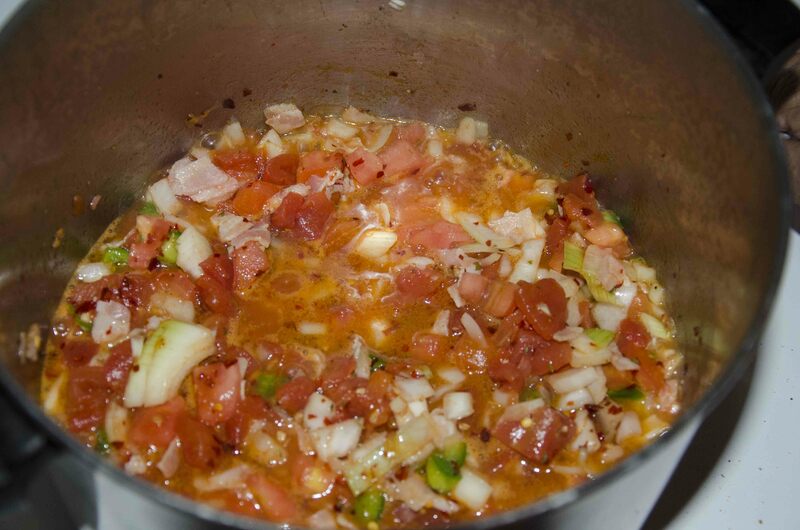 Put the bacon and vegetables into a large saucepan over medium heat. Cover and cook, stirring occasionally, until the tomatoes turn from bright to dark red and the mixture reduces by about half. This should take around 20 minutes. Cover and cook on the lowest heat, 45 minutes to an hour. Twice during cooking time, carefully turn the rice over from bottom to top. 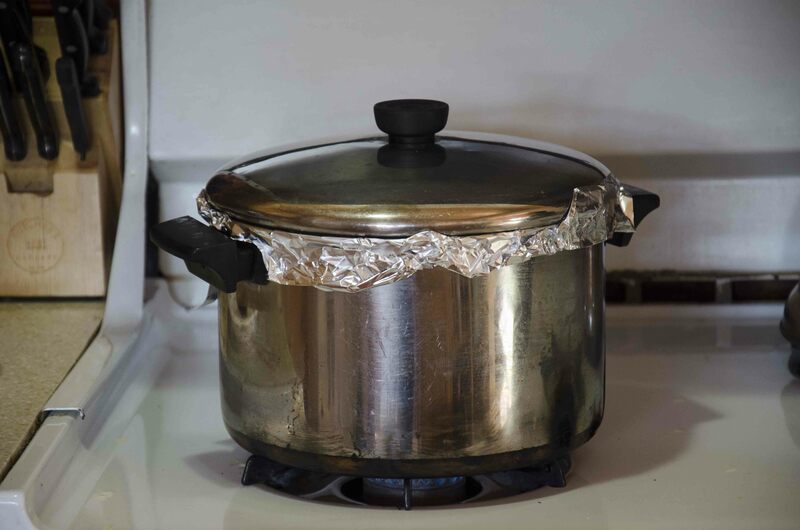 The foil pictured on the pot is there to seal in the steam. Cut brown paper bags also work well for this purpose. 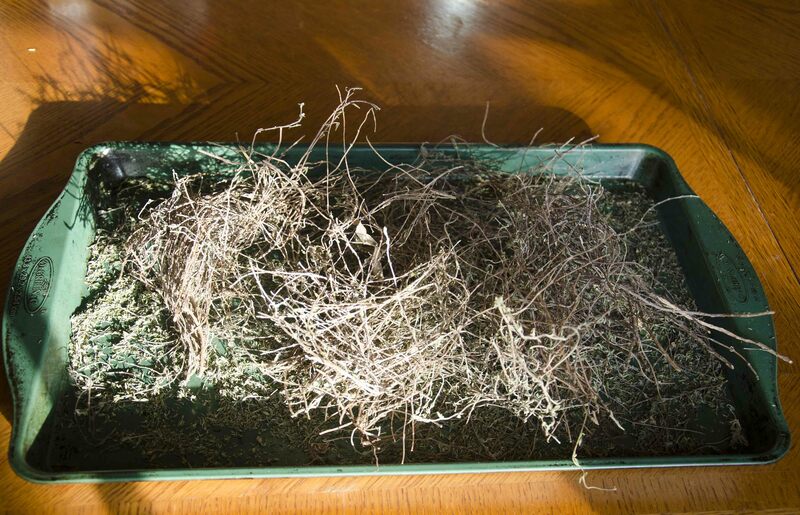 If Aunty Ruth is using a pot with a heavier lid then she skips adding this layer. YASSSSS! I think I am going to try this soon. It is pretty sad that I have never tried to cook peas n rice and I’m almost 30! So thanks for sharing the recipe! loll, you’re welcome! lemme know how it turns out! Hi Gabrielle, I love your web site! It almost makes a Pennsylvania winter seem bearable just looking at the pictures. I dated a girl from Freeport for about 10 years and I really miss her… cooking. She introduced me to tuna & grits which is still my favorite breakfast of all time. After reading your recipe and step by step instructions along with pictures, I feel confident that I may be able to step up to attempting to make them myself. Toasting Pop-tarts is about the extend of my culinary skills (so far.) You mentioned Bahamian Mac & Cheese above which Bahamians take to a whole new level compared to the traditional Mac & Cheese in the US. Could you please produce a step by step recipe for that dish as well? I’m sure it would be greatly appreciated by many (especially myself.) Thank you.